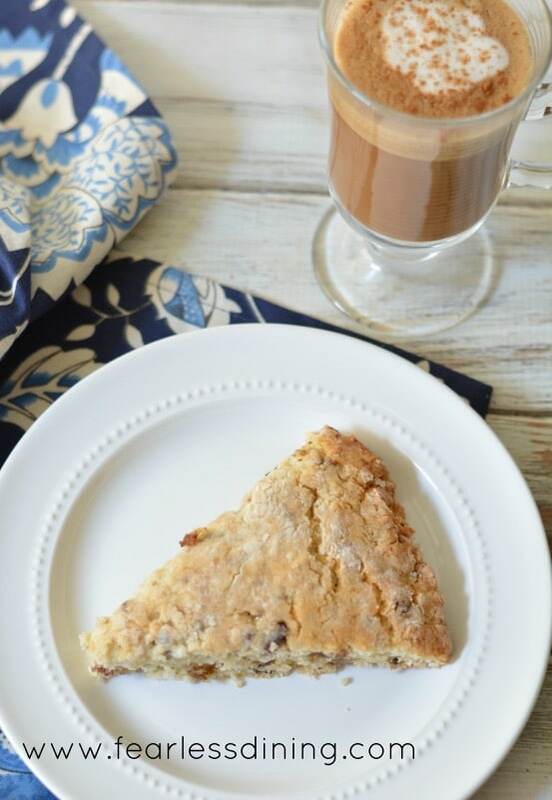 Date scones with coconut and pecans are light and flaky, with a little nutty crunch. Perfect with a cup of coffee. 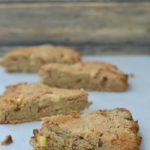 You’ll want to make a double batch of this gluten free scones recipe! These step by step directions should help you become a scone expert in no time. Learning how to eat gluten free has never been easier! I am finally making a sweet scone recipe :-). 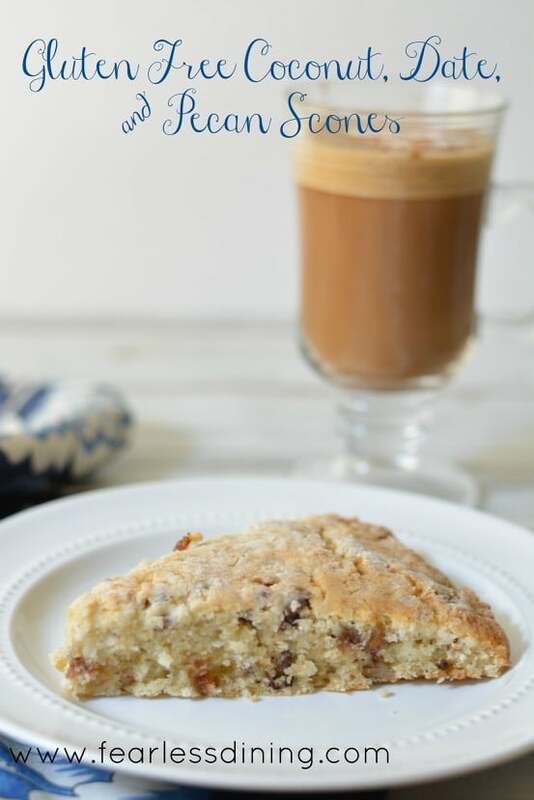 You will love how easy this date scones recipe comes together! 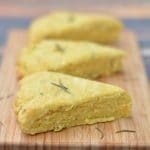 I have made a lot of savory scones, like these gluten free buckwheat cheddar scones and gluten free delicata squash cornmeal scones, and I thought it was time to make a sweeter scone. I found some sweet looking dates in our grocery store and I thought these would work well with coconut and pecans. To make the date scones a gluten free scones recipe, I used the Bob’s Red Mill’s new 1 to 1 gluten free flour blend that I picked up at my local Costco. This flour blend is a lot lighter, with more starch, so the date scones are not only flaky, but lighter in texture as well. The dates and coconut give these scones a light sweetness to them. Even my picky child loves them! If you do make that double batch, feel free to freeze some, because these date scones are completely freezable. Use a pastry blender to cut the butter into the dry ingredients. 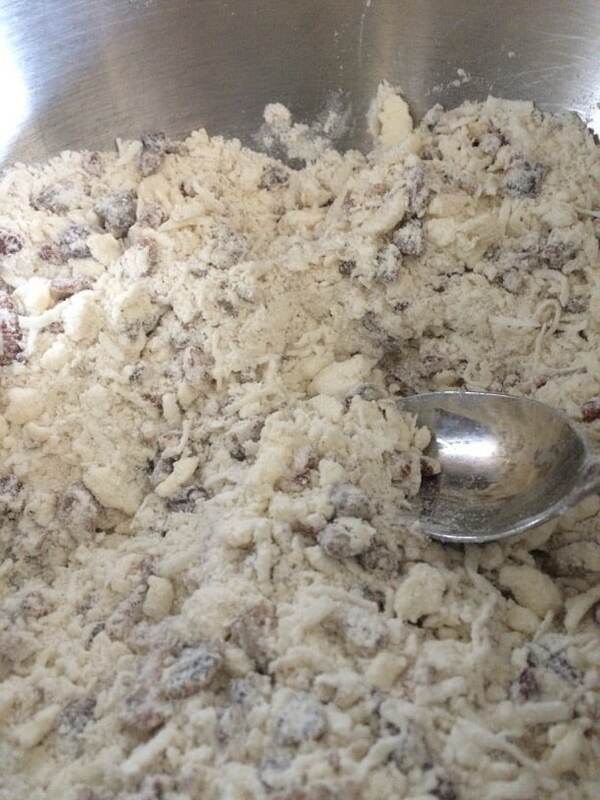 Your dough will look grainy like this before you add the wet ingredients. 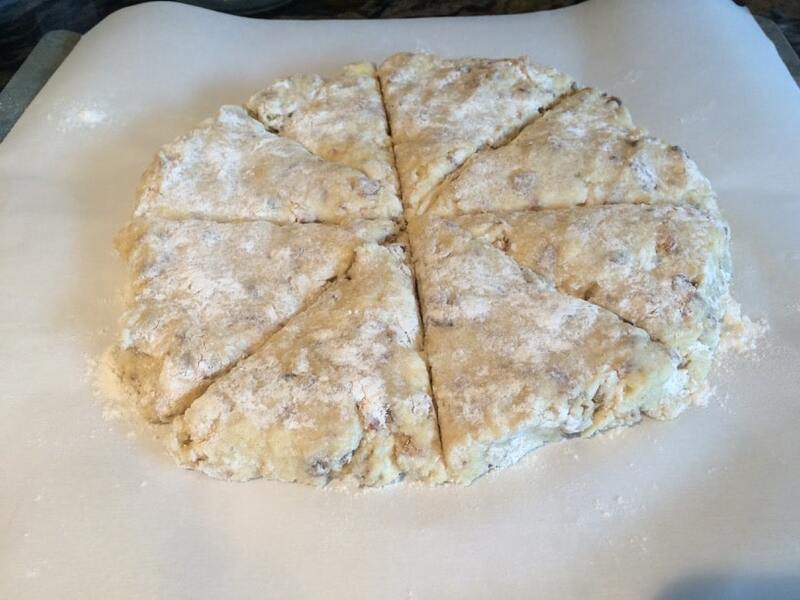 Spread the date scones dough out on parchment paper and make cuts in the dough. Once it is baked you just need to cut it again along those same lines. 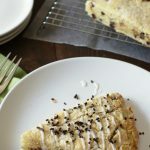 This gluten free scones recipe makes date scones that are super flaky and packed with coconut and pecans. Click here to see all of the scone recipes on this blog. Date scones with coconut and pecans are light and flaky, with a little nutty crunch. Perfect with a cup of coffee. 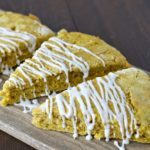 You'll want to make a double batch of this gluten free scones recipe! 1/2 cup sugar, use 1/4 if you use sweetened coconut. In a large bowl add all dry ingredients. Add butter in chunks to the flour. Using a pastry blender, cut butter into the dough until the flour mixture is grainy. Add wet ingredients and mix ins and stir to blend. Put a piece of parchment paper onto a cookie sheet. Sprinkle a little flour on top of the dough and shape it to a round flattened circle about 2 inched tall. When scones are cooled down, use a knife along cut marks. 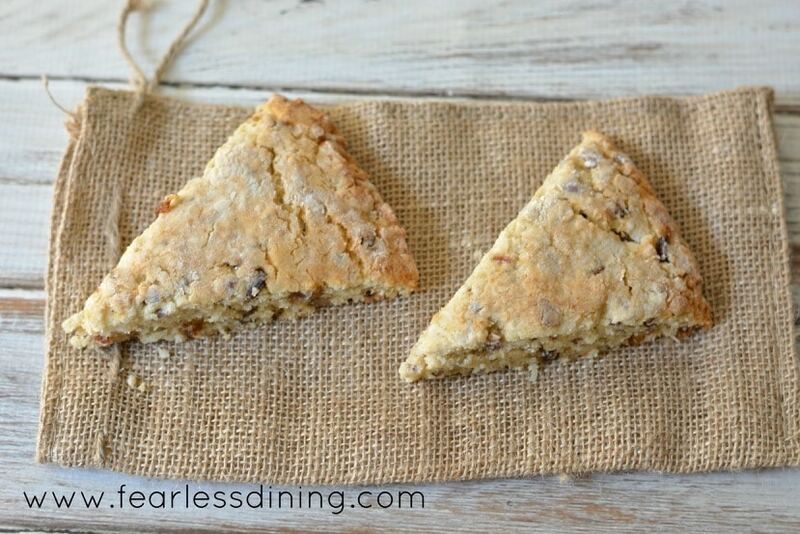 If you love the date scones, try these Gluten Free Pear and Gorgonzola Scones! Delicious!! What a great recipe. My husband keeps eating them on me. I tell him that he can eat anything in the house and he always chooses my gf snacks. He says it’s because everything I make is so good. I did substitute coconut palm sugar for the refined sugar. Just made these – they are excellent! I substituted buttermilk for the almond milk as I have lots of extra buttermilk to use after I bought a 2 pint carton for a recipe which called for 1/2 cup. I used my Cuisinart food processor to mix the ingredients as I don’t have a pastry cutter (amazing as I have just about every other gadget or machine in my kitchen) – worked out great and made the overall recipe very easy to assemble – I just had to be careful to pulse the processor and not over mix. What a sublime blend of flavours! I want a taste! These look so delicious and moist! 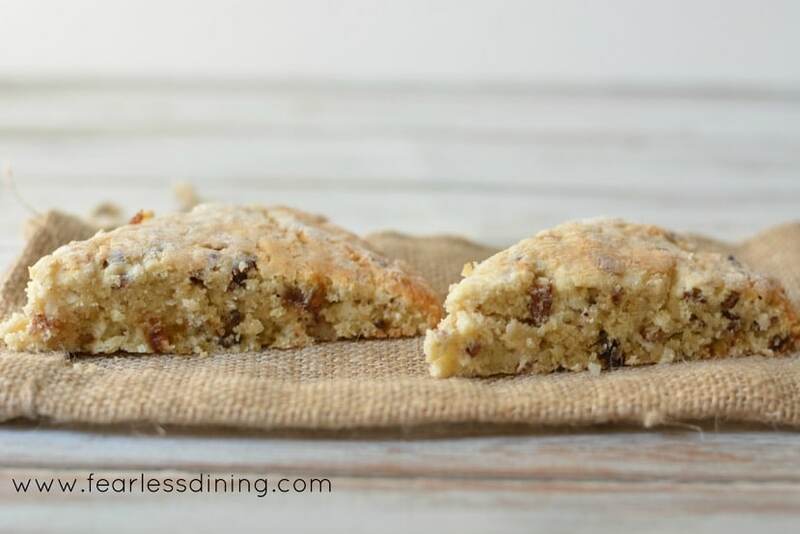 There is nothing better than a date scone, and these look to die for! A must-try! Perfect with my cuppa for sure. Love that it’s gluten-free, too! I have used the Bob’s gluten free stuff before. It is really great stuff. I love the combination of dates and pecans. Brilliant! 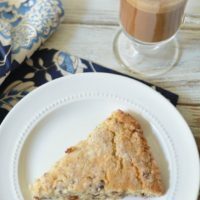 This is one of the few gluten free scone recipes I want to try. Thanks, Sandi! 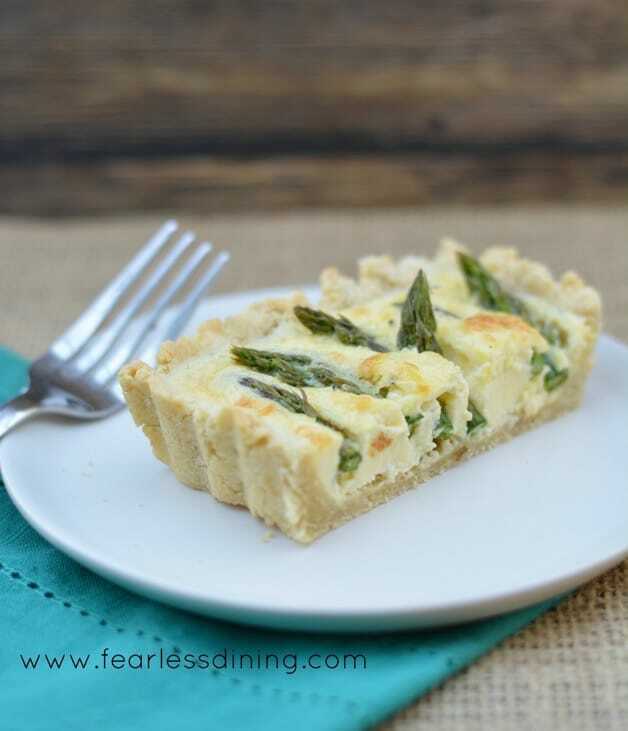 I can promise you would never know it is gluten free…it is pretty delicious. These sound wonderful! Can’t wait to try them! Mesmerizing and utterly delicious looking! I’m not even sure a double batch would suffice our gang; great job with these beautiful scones! You do have a much larger gang than we do 🙂 Enjoy.